Rebecca Graf has read 54 of 125 books. Rebecca Graf read 124 books of her goal of 50! Rebecca lives in Brown Deer, Wisconsin with her husband and three children and has lived in Kentucky, Alabama, Tennessee, South Dakota and Wisconsin. Graduated from the University of Montevallo with an accounting degree, Rebecca has been writing after 20 years in the accounting field. She also has a history BA with an English minor. Currently she is going for her English major with creative writing. Reading is a passion of Rebecca's that has spilled over into her writing. She has been writing online for 8 years on a variety topics including history, education, writing, religion, and facts of life. She runs the website The News in Books (www.argiletumtransitorium.com) and writes on HubPages. 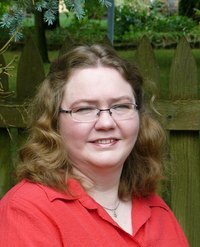 She also edits and formats book for ebook and print Rebecca lives in Brown Deer, Wisconsin with her husband and three children and has lived in Kentucky, Alabama, Tennessee, South Dakota and Wisconsin. Graduated from the University of Montevallo with an accounting degree, Rebecca has been writing after 20 years in the accounting field. She also has a history BA with an English minor. Currently she is going for her English major with creative writing. She runs the website The News in Books (www.argiletumtransitorium.com) and writes on HubPages. She also edits and formats book for ebook and print. We’d love your help. Let us know what’s wrong with this preview of Darkness Dawns by Dianne Duvall. We’d love your help. Let us know what’s wrong with this preview of Dark Lover by J.R. Ward. We’d love your help. Let us know what’s wrong with this preview of To Everything a Season by Lauraine Snelling. We’d love your help. Let us know what’s wrong with this preview of Sons Of Wrath Box Set by Keri Lake. We’d love your help. Let us know what’s wrong with this preview of The 19th Element by John L. Betcher. We’d love your help. Let us know what’s wrong with this preview of Surrender by Pamela Clare.
" David wrote: "Hi Rebecca, I hope you aren't too swamped with requests. I have an YA historical fantasy 85K long. 1511. Two young friends of a tiny race David wrote: "Hi Rebecca, I hope you aren't too swamped with requests. I have an YA historical fantasy 85K long. 1511. Two young friends of a tiny race, Frother and Horrock, watch humans fight for the dominance..."
I would be glad to. Email to writingwithsuccess@gmail.com ...more "
Today's virtual book tour at www.abookloverslibrary is for Virgil Moore, author of Demon Vampire. Check it out.